Intu has worked with multidisciplinary teams in remote locations in tropical landscapes and seascapes in Asia, Africa and Latin America. Intu has focussed on issues with indigenous people and local communities, particularly on the importance of their traditional knowledge and wise practices in natural resources management and the conservation of their cultural diversity. Intu’s research has sought to enable forest dependent people, coastal communities and indigenous groups to achieve a balance between conservation and social, cultural and economic development. Intu uses visual techniques to explore landscape scenarios and other participatory methods to maximize the involvement of diverse stakeholder groups. Her goal is to have an influence on global efforts to support indigenous people and local communities to improve their livelihoods whilst retaining their identity, cultural diversity, traditional knowledge, environment and natural assets. BULL, G., BOEDHIHARTONO, A., BUENO, G., CASHORE, B., ELLIOTT, C., LANGSTON, J., RIGGS, R. & SAYER, J. (2018). Global forest discourses must connect with local forest realities. International Forestry Review, 20, 160-166. RIGGS, R. A., LANGSTON, J. D., MARGULES, C., BOEDHIHARTONO, A. K., LIM, H. S., SARI, D. A., SURURI, Y. & SAYER, J. (2018). 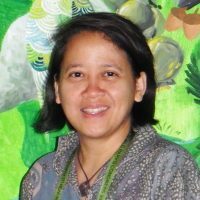 Governance Challenges in an Eastern Indonesian Forest Landscape. Sustainability, 10, 169. Boedhihartono, A.K. (2017). Visualizing the Future We Want: Reconciling Art, Environment and Development. In Aesthetics of Development: Art, Culture and Social Transformation (edited by A. Giri and J. Clammer). Palgrave MacMillan, New York. BOEDHIHARTONO, A.K. (2017). Can Community Forests Be Compatible With Biodiversity Conservation in Indonesia? Land, Special Issue, 6, 21. SAYER, J., MARGULES, C. & BOEDHIHARTONO, A. (2017). Will Biodiversity Be Conserved in Locally-Managed Forests? Land, 6 (1), 6.